Sarah Polley has seemed wise beyond her years at least since her childhood turn in Terry Gilliam's The Adventures Of Baron Munchausen. More recent films, like My Life Without Me and No Such Thing, while heavily flawed, have still showcased her as an introspective actor who's serious about her art. So it's no huge surprise to see her making the leap to feature writing and directing with the same self-assurance and focus. But it is a little surprising to see Polley, at 28, making a film about end-of-life issues and romance among the gray-haired set. Still, she tackles her directorial debut with the feeling gravity of someone who's been there herself. 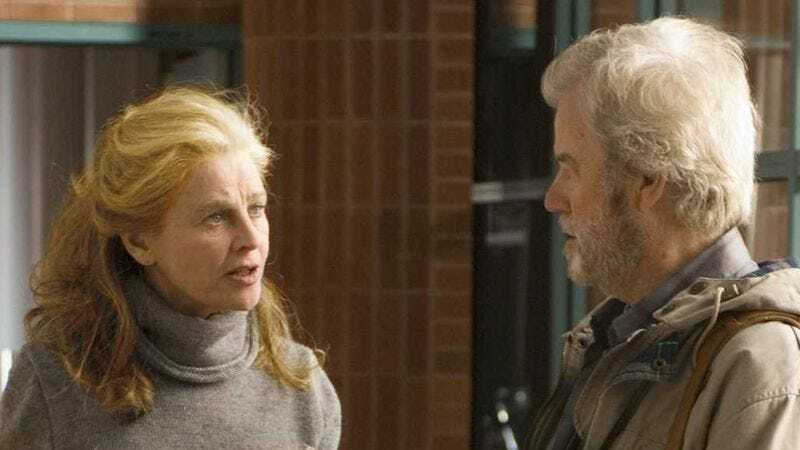 Away From Her, a fairly literal but more expansive adaptation of Alice Munro's short story "The Bear Came Over The Mountain," stars Julie Christie and Gordon Pinsent as a Canadian couple in their declining years. When Christie starts putting pans in the freezer, losing her language skills, and getting lost in their back-lot woods, they find an upscale facility ready to take over her care. But Pinsent resists the move, still clinging to memories of her youthful vibrancy, his guilt over long-ago affairs, and his dependence on their 50-year relationship. That leaves Christie to calmly take charge of the situation, checking herself in and shooing him away. It comes as a blow to him when her condition worsens and she begins to forget him, taking up instead with mute resident Michael Murphy, which leads Pinsent into an odd relationship with Murphy's wife, Olympia Dukakis. Away From Her has its heartbreaking moments and its surprise giggles, particularly thanks to Ron Hewat's minor role as a former hockey play-by-play announcer now narrating his nursing-home life. It also has its minor pretensions, mostly in Polley's achronological storytelling, which interferes a bit with the story's elegiac flow. But mostly, it's a subdued, well-shot character study that observes rather than dictates emotions. Christie's fears and Pinsent's resentment are played subtly, as if both characters have outgrown emotional displays; there are no weepy histrionics or Oscar-bait speeches. This is how real lives often end: with a thoughtful whimper or two, particularly over how people inevitably change, taking relationships with them in the process.